I worship my most merciful AchAryan nAyanArAchAn piLLai who extracts and shows the essence of vEdham, who is like a gentle sun which blooms the smruthi which are like lotuses, who is eternally related to srIman nArAyaNan's lotus feet, who is an emperor of all true knowledge and who is the dear son of abhayapradharAjar (periyavAchAn piLLai). I offer my loving worship to my AchAryan nAyanArAchAn piLLai who is the dear son of abhayapradhapAdhar (periyavAchAn piLLai) and who wrote charamOpAya nirNayam to uplift everyone in this world. This beautiful grantham starts with 4 invocation slOkams that are written by nAyanArAchAn piLLai himself in glorification of periyavAchAn piLLai and spelling out the purpose of this grantham. I surrender to periyavAchAn piLLai who is my AchAryan and famously known as abhayapradhapAdhar (because he established the greatness of sharaNAgathi and emperumAn's sarva lOka sharaNyathvam). I am going to compile this charamOpAya nirNayam purely out of his grace. I was born out of the divine mercy of my father periyavAchAn piLLai. I am establishing the ultimate path of salvation following in the footsteps of periyavAchAn piLLai. I worship yathirAjar who is the AchAryan for the whole world and the one who uplifts us. By being urged by his mercy, I am establishing the utlimate path of salvation. I am clearly establishing the ultimate path of salvation to be emperumAnAr through the divine srIsUkthis (words) of AchAryas who appeared before and after emperumAnAr and through the various incidents which were seen and explained in the svapnams (dreams) of reliable persons. It is because of the fact that the ultimate path of salvation is established in this grantham it became to be known as charamOpAya nirNayam. 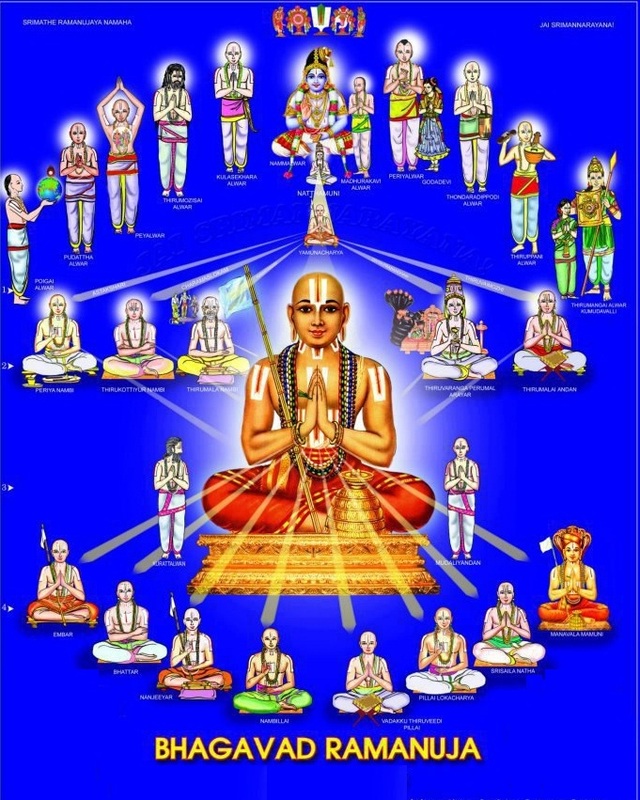 Even though srivaishnavas are firmly situated in their AchAryas and confident that their own AchArya will uplift them from this samsAram, since all the AchAryas themselves instructs their sishyas to fully depend on udayavar, only udayavar can be identified as uththArakar (one who can uplift some one from samsAram to place them under the lotus feet of emperumAn in paramapadham) for everyone. As seen in the following slOkam (which is subsequently quoted by piLLai lOkam jIyar as a work of periyavAchAn piLLai in his wonderful work srivaishnava samayAchAra nishkarsham), it is well known that the quality of being an AchArya manifests fully in udayavar. This is also highlighted by vaduga nambi's words that "AchArya padham is a special position and it fully fits to emperumAnAr only" (We have already seen this in the previous article). vishNu is the master of everyone. NammAzhwAr who is filled with good qualities is his vigraham (thirumEni/divine manifestation). emperumAnAr who is a kainkarya srImAn is the lotus feet of NammAzhwAr. The word (and its meaning) of "AchAryan" brilliantly glows on emperumAnAr. So, the whole guruparamparai is subservient to emperumAnAr. All the AchAryas before emperumAnAr were able to see what is coming in the future. Because of that they firmly followed and preached the words of NammAzhwAr from thrivAimozhi 5.2.1 "kaliyum kedum" (கலியும் கெடும்) meaning kali will be destroyed by the appearance of emperumAnAr. Even though they have firm faith in emperumAn and their own AchAryan, considering their relationship with emperumAnAr they would constantly meditate on emperumAnAr's uththArgathvam. Relationship can be two ways - ArOhaNa (ascending) and avarOhaNa (descending). Ascending means going up the chain (i.e., AchAryan, his AchAryan, etc) and descending means going down the chain (sishyan, his sishyan, etc). In both ways, emperumAnAr is the root. Of these two ways, the ascending chain has an end at emperumAn srIman nArAyaNan who is the first AchAryan and the descending chain is endless since it keeps growing with each AchAryan and his sishyas and so on. These relationships are centered on emperumAnAr. As it is seen in the OrAN vazhi guru paramaparai (starting with emperumAn and ending with mAmunigaL) emperumAnAr is the AchAryan right in the middle. Just like when a diamond is placed in the center of a pearl string, both sides of the string shines much more, through his presence in the middle, empeumAnAr brings out the glories of the guru paramparai in either sides of him, even more. Since emperumAnAr is right in the middle, he becomes the mediator for both sides. Just like nama: padham (that is in the center) in thirumanthram helps to relieve the hurdles of the jIvAthmAs, emperumAnAr (who is in the center of the AchArya rathna hAram) also dispels the miseries of jIvAthmAs. nama: padham represents the upAyam, so we can understand the emperumAnAr is the upAyam for everyone. It is because of this the following slOkam came into existence. AchAryas after emperumAnAr established that they get mOksham due to emperumAnAr's thirvadi (lotus feet) sambandham with them. AchAryas before emperumAnAr established that they get mOksham due to emperumAnAr's thirumudi (head) sambandham. Such emperumAnAr declared that he gets mOksham due to his sambandham with AzhwAn. How can we spell out the glories of such kUrathAzhwAn? Note: The point of relevance for this grantham is in the first 2 lines of this slOkam. This AchAryathvam is of 2 types - svANuvruththi prasaNNAchchAryathvam (ஸ்வாநுவ்ருத்தி ப்ரஸந்நாச்சார்யத்வம்) meaning AchAryas who test their sishyas to the maximum and give out the rahasya meanings and krupAmAthra prasaNNAchchAryathvam (க்ருபாமாத்ர ப்ரஸந்நாச்சார்யத்வம்) meaning AchAryas who give out the rahasya meanings to the sishyas fully out of their own mercy looking at the sufferings in this samsAram. Of these two, the former (svAnuvruthi prasannAchAryas) are seen more commonly and the latter (krupAmathra prasannAchAryas) are seen occassionally. An ordinary sishya can be confident of achieving the ultimate salvation only while being surrendered to a krupAmAthra prasannAchAryan since it is impossible to please a svAnuvruthi prasannAchArya for an ordinary sishya who does not have the patience, determination and ability to act according to sAsthram. In this relation, during a conversation between ANdAn and AzhwAn, AzhwAn insists that only krupAmAthra prasannAchAryas can uplift everyone. periyavAchAn piLLai often quotes aruLALa perumAL emperumAnAr's jnAna sAram pAsuram 36 "maththagaththuth than thAL aruLAlE vaiththa avar" (மத்தகத்துத் தன் தாள் அருளாலே வைத்த அவர்) meaning the krupAmAthra prasannAchArya who mercifully placed his lotus feet on the head of his sishyas to relieve them of their miseries. Just like paragatha svIkAram (over svagatha svIkAram) is more suitable for jIvAthma svarUpam in prathama parvam (i.e., emperumAn accepting us voluntarily out of his mercy instead of us insisting him to accept us), the same thing applies in charama parvam (in AchAryan vishayam) as well - so it is more suitable for the sishya svarUpam if the AchAryan himself voluntarily accepts the sishyan and blesses him/her with the divine knowledge. So, uththArakthvam fully manifests in krupAmAthra prasannAchAryas only. The AchAryan out of his utmost mercy who protects and delivers the sishya who is surrendered to him - that AchAryan is the most important one. This is identified by trustworthy persons. Such krupAmAthra prasannAchAryas will also have uththArakathvam (the ability to uplift jIvAthmAs). But this uththArakathvam fully manifests in udayavar only. Out of his own difficult personal endeavours he pleased thirukkOshtiyUr nambi and received the charama slOkam meanings. But out of his own mercy, he gave out those most secret meanings to the ones who desired to learn them. This shows his utmost kAruNyam (grace). 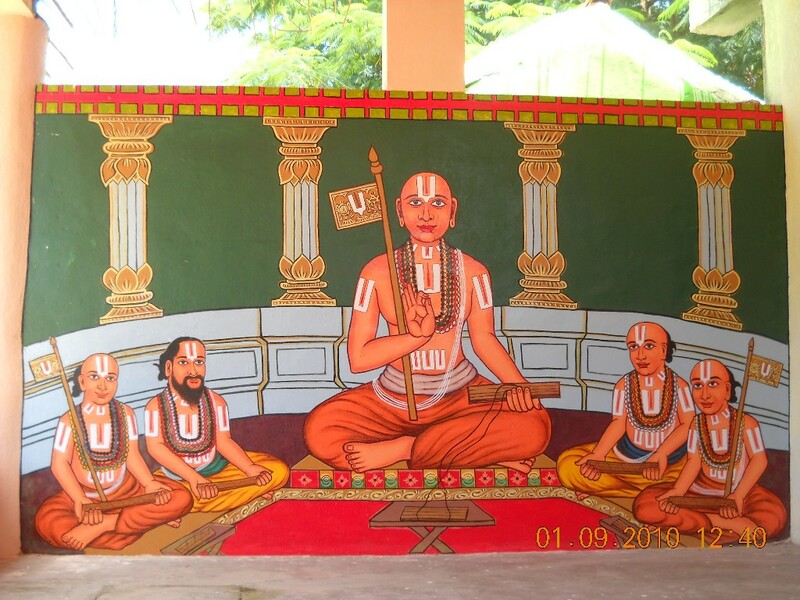 There was an arayar swAmy named rAja mahEndhra perumAL arayar. He had a son named arangamALikai who did not listen to his father's instructions and had bad friendship. Coming to know about this, udayavar sent his disciples to fetch him and bring him over to meet with him. udayavar tells him "dear son! even if you leave me, I am not going to leave you" and brings him over to his thiruvArAdhana perumAL pEraruLALan and re-establishes emperumAn's sambhandham to him, instructs him with all the rahasya meanings, places his lotus feet on arangamALikai's head and asks him if he is able to understand the difference between his lotus feet and the other feet he was behind before. He tells him that his lotus feet will lead him to mOksham while the other feet will lead him to narakam and asks him to always depend on his lotus feet. After that arangamALikai had constant faith on emperumAnAr's lotus feet and followed the proper principles. periyavAchAn piLLai personally explained this incident to me (nAyanArAchAn piLLai) and developed my faith/confidence in udayavar's lotus feet. From these 2 incidents learned persons will understand and accept the uththArakathvam of udayavar. To establish it further we will see the divine words and incidents seen in the dreams of the AchAryas before udayavar subsequently. Swami; please dont stop this kainkaryam. Dasan is very happy to see the english translation of this wonderful acharya sri sukthi. Please please continue this and let this dasan enjoy the bliss.